Your organisation, like so many others, is most likely increasing its use of SSL/TLS to protect sensitive data and reduce risk. 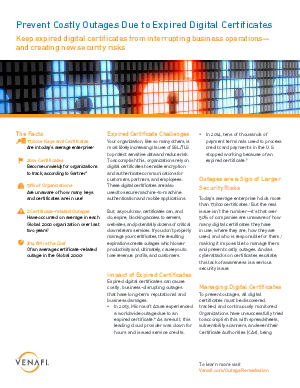 To accomplish this, organisations rely on digital certificates to enable encryption and authenticate communications for customers, partners, and employees. Expired SSL certificates can cause outages if not replaced in time.